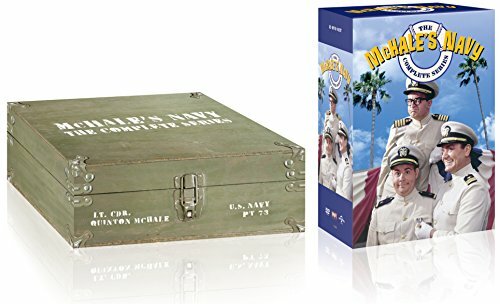 Climb aboard the PT-73 and set a course for classic television comedy with McHale's Navy: The Complete Series , a 138-episode voyage of military mirth and madness. With an amazing cast, including Academy Award® winner Ernest Borgnine, comic genius Tim Conway, and the indisputable brilliance of Joe Flynn, McHale's Navy was a mainstay of television viewing throughout its original network run from 1962-1966 and an unsinkable juggernaut in reruns for decades to come. In the Pacific Theater of WWII, veteran seaman Quinton McHale (Borgnine) is commissioned into the Navy Reserve and named skipper of the Torpedo Patrol (PT) Boat #73. Along with his crew of good-hearted swabbies who love to have fun, McHale is a constant thorn in the side of his base commander, Captain Wallace B. Binghamton (Flynn). Binghamton is forever trying to find a way to get rid of McHale and his rule-bending crew, while McHale and company are forever scheming to keep him from succeeding. It all adds up to the wackiest tour-of-duty television has ever seen! Featuring sharp writing and an indelible supporting cast, including Carl Ballantine (Mr. Saturday Night) and Gavin MacLeod (The Mary Tyler Moore Show, The Love Boat), McHale's Navy is classic television at its finest – and funniest. * THE CREW REUNION – Ernest Borgnine, Tim Conway, Carl Ballantine, Bob Hastings and Edson Stroll reunite and share their memories of the show. McHale’s Navy (1964) and McHale’s Navy Joins the Air Force (1965)!